CSR have unveiled the first SiRFstarV chip optimised to deliver continuous location data for smartphones, tablets and other mobile devices. 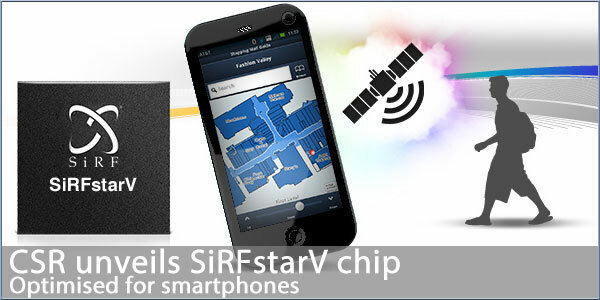 SiRFstarV 5t tracker supports all four global navigation systems (GPS, GLONASS, Compass and Galileo) and has enhanced MEMS (micro-electro-mechanical systems) support. This allows it to utilise data from mobile devices equipped with MEMS sensors to enhance navigation accuracy and reduce power consumption. Other features include advanced power management for longer battery life, improved immunity to interference from LTE, the latest cellphone radio signal standard and active jammer removal which allows it to track and eliminate interference. LG's Optimus 4X HD is the first smartphone to use the chip. More information on SiRFstarV can be found in the source link below.